In the 52-week active control period, one patient has missing ethnicity. Q1, 25th percentile; Q3, 75th percentile; MI/CAD, myocardial infarction/coronary artery disease; CVA, cerebrovascular accident; TIA, transient ischemic attach; NA, not applicable; iPTH, intact parathyroid hormone. ↵a Chi-squared tests were used to compare treatment percentages, and t tests were used to compare treatment means. ↵b ESRD cause by precedence polycystic kidney disease, glomerular disease, diabetic nephropathy, hypertensive nephrosclerosis, and all others. 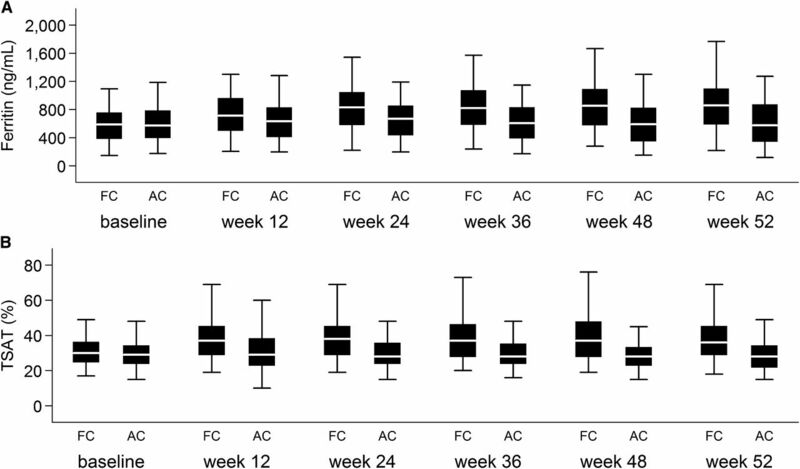 ↵c All subjects entering the 4-week placebo control period completed the 52-week active control period on ferric citrate. A last follow-up observation with carried forward imputation was used to impute missing values for all laboratory outcomes; 91 patients were analyzed for both the ferric citrate and placebo control groups in the 4-week placebo control period. Q1, 25th percentile; Q3, 75th percentile; ANCOVA, analysis of covariance; 95% CI, 95% confidence interval. A last follow-up observation with carried forward imputation was used to impute missing values for all laboratory outcomes. Sample sizes for the 52-week active control period ranged from 247 to 281 patients for the different outcomes in the ferric citrate group and from 132 to 146 patients in the active control group. Q1, 25th percentile; Q3, 75th percentile; ANCOVA, analysis of covariance; 95% CI, 95% confidence interval; iPTH, intact parathyroid hormone. ↵a Week 52 levels are summarized for all outcomes during the 52-week active control period with the exception of iv iron and ESA dose, which are summarized over the entire follow-up period. ↵b Hodges–Leman estimate of location shift and 95% confidence limit.